This winter has been very mild so far, with our coldest weather starting this week and expected to last through the first week of January. As I've had an extra day off the last two weeks, I started to go through my gear and see if everything is up to par and ready for the weather. Yes, temperatures in the 30s classifies as cold in California. Deal with it! My best rain coat, a Goretex Marmot jacket I've owned for the better part of 20, years just had thezipper pull break. This doesn't make the jacket unusable, just not very convenient to use right now. Marmot will service the jacket for free if there is a mechanical problem like the zipper or a snap fails (which they have done for me in the past). I will be sending the jacket in next summer to be fixed, since it is being used right now. The two inexpensive emergency space blankets that were in my G.H.B. were both damaged by heavier, sharp-edged items shifting around and tearing both the packaging and blankets. This is my fault, as the blankets could have been placed inside a zip-lock bag for extra protection or placed in a side pocket and not allowed to migrate to the bottom of the bag. The Tylenol, Advil and Triple Antibiotic were all out of date and from being kept in my truck, probably should have been replaced sooner. The band-aids in my kit were also damaged (by heat, I think) since the paper protective wrapper was separated on half the box. All my other gear looks fine. Cans of chicken and tuna are in good shape, as are the jerky and energy bars. However, the bars were pretty smashed but the wrappers did not tear, so that was a plus. The small bottle of Dr. Bronner's soap (kept in its own zip-lock bag) is intact. My Life Straw, Sawyer Mini filter and Katadyn Micropur MP1 tablets are fine. Socks, long sleeve polypropylene tee shirt, knit cap and rain hat are in good shape. If you get an hour or so, take the time to inspect all your gear. You never know what you will find and what shape things are in until you look! After telling everyone NOT to buy me anything, I recieved several gifts. People don't listen. The Doan Magnesium is a familiar item but I had no idea what this shovel would look like. The U-Dig-It seems pretty cool, if a bit heavy at 6 ounces, but looks very sturdy. I do not have any other digging tools in my G.H.B. at the moment, so this is a needed addition. A test and evaluation will be coming in the near future. I also received a $50 Amazon gift card, from my son and his wife. Who was really told not to get me anything, but whose kids ever listen to their parents? Thank you all for the nice gifts, cards and Christmas Wishes. I hope the New Year sees you never needing your supplies, but always having them ready. You take care of your car. You maintain it well. You expect it to take care of you. Then one day, when you can least afford it to fail, you put your key in the ignition and are rewarded with only a click. Your battery is flat. Oh, woe! What to do? As with the rest of life, step one is Don't Panic. The rest of the solution depends on where you are and what help you have. 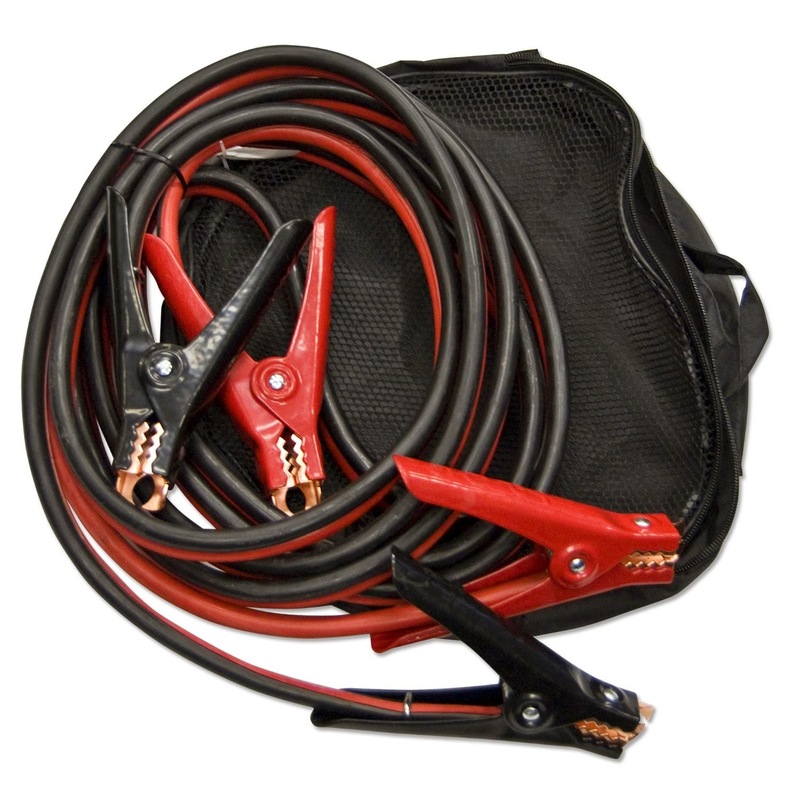 Jumper Cables: Way back when I talked about my Car Survival Kit, I mentioned carrying a good set of jumper cables in my truck. They are the most basic way to jump start a dead vehicle, assuming you have another car around to jump yours. Be very careful to not touch the ends of the cables together while they're connected to any battery or car. They can cause a deadly electric shock. There are two schools of thought with regard to positioning of jumper cables on the dead car side. Some folks advocate attaching the black lead to a bare metal body piece on the car. I, and various others, feel better results are obtained by hooking the black lead to the negative (marked -) terminal. Either one should work. Next, connect the red/orange/light-colored lead to the positive (marked +) terminal of the battery. Connect the same colored leads to the same marked terminals on the live car. Start the engine on the live car, and allow it to run for a few minutes to give a bit of charge to the dead battery. While the live car is still running and connected, start the dead car. Disconnect the cables in the reverse order that you connected them. 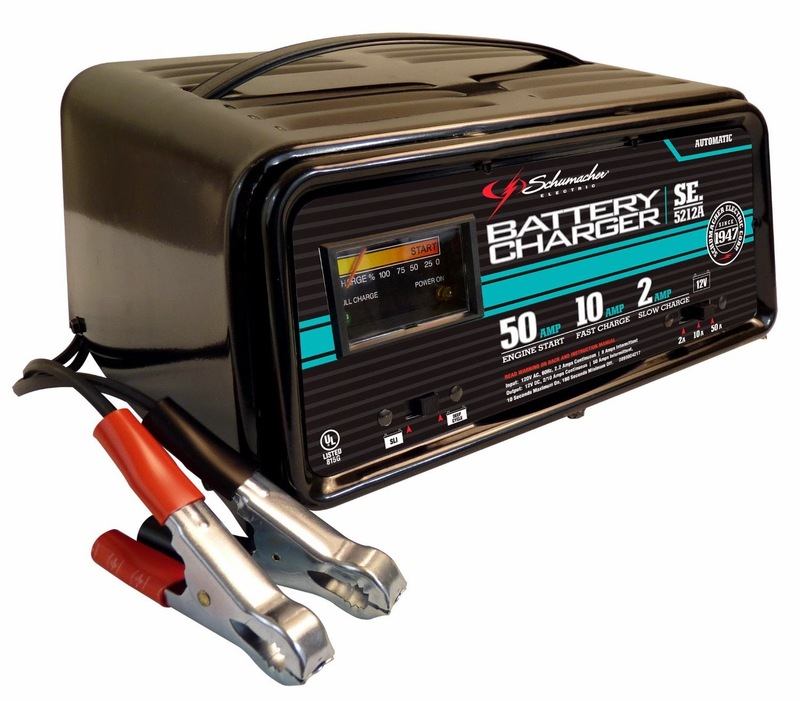 Plug-In Chargers: If you're at home, or at least near a power outlet, a battery charger gives quick, sure starts, and doesn't require another vehicle. 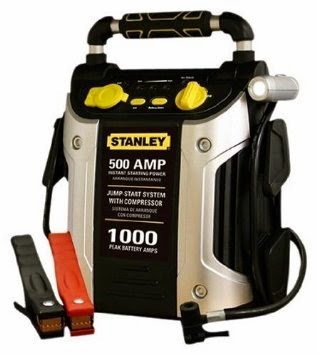 Simply plug it in to the wall, connect the leads to the battery just like jumper cables, and start your car. If you have time, you can allow the charger to actually charge the battery as well. Jump Starters: Cables require another car and chargers require an outlet, but Jump Start Packs overcome both of those shortcomings. They are a self-contained battery pack with built-in cables and a charging port. The linked unit also contains a light and an air compressor, for inflating tires that may be a bit low. They aren't cheap, but they're invaluable when your battery goes flat in the middle of nowhere. I owned one for several years, and finally wore it out to the point where the battery would no longer hold a charge. They're expensive, but they're very worth it, the first time they save you in the middle of nowhere. Keep yourself from getting stranded. Erin Palette talks about fitness for preppers. Miguel Gonzalez gives you his pick for the best Christmas movie of all time. Barron B. explains when security updates aren't enough. and Weer'd breaks down some audio anti-gun hate. You can listen to the podcast here, and the show notes may be found here. It's time for Episode 18 of The Gun Blog Variety Cast! Adam and Sean host in their usual excellent style. Erin Palette wants you to pay attention to priorities. Miguel Gonzalez says "Read those Primary Sources!" Barron B. talks about police using Stingray devices. and Weer'd Beard offers an epilogue to his "Gun Death" series. Check it out. Download, listen, and subscribe. And tell a friend! Video #3! Hopefully (hopefully!) I have fixed the problem with the jerky video that plagued unboxing #2 and made it unwatchable by some. Audio should also be substantially better, due to a lovely Christmas present of a quality microphone and stand from a dear, dear friend. I am amused that I already had 3 of the items in this month's box, but I'm not at all upset; I had planned to get seconds of them anyway, and seeing them here reassures me that at least some of my choices are sound. For those interested, the Piddly Stik may be found here. Through conversations with them on their Facebook page, I've been told that they will soon be posting videos on how to set up, and how to fish with, the P. Stik. I am looking forward to those, as it looks like a quality bit of handmade kit and not a cheap piece of plastic crap like a pocket fisherman, and I want to understand how to use it. EDIT: Brook West has found a demonstration video of how to use the Piddly Stik. Thanks, Brook! Enjoy my video, and please, leave comments! I'm always looking for ways to improve! Pictures of the box's contents may be found here. 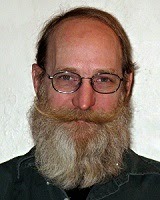 I have been asked to do a compare-and-contrast covering the various methods of water treatment available for preppers. Having spent 18 years operating a waste water treatment plant (the same technology as drinking water treatment, just with looser standards), I'm the closest we have to an expert on the subject so I'll give it a shot. This will be just an introduction to water treatment, with more details in future articles. This is a very important subject and I don't want to leave out information, but I also don't want to write a ten page article that nobody is going to finish reading. Before getting into specific methods or brands of treatment I need to ask a few questions. All of these will come into play when you start looking at filters and other treatment methods. How clean do you want/need your water? I have worked in labs that required water so pure it would dissolve copper tubing, and I spent many years discharging treated water into a major river that was dirtier than what I was putting into it. Some uses may not require water as clean as others, I'm pretty sure your dog (who drinks out of the toilet and stray mud puddles) doesn't need water treated to the same standards as you'd use for mixing baby formula. The EPA and WHO have established drinking water quality standards, technical data that I'll try to put into layman's language. Also, not all raw water needs to be treated. Rain water and melted snow would be safe to drink in all cases, unless you're dealing with chemical or nuclear fallout. I grew up drinking water straight from a (fairly deep) well and have never had any issues with it. You can also develop a resistance or immunity to any local microbes that don't immediately kill you, but changing location will change the definition of “local” and you may run into problems until your body adjusts (Montezuma's Revenge). What's in the water that you need to remove? Unless you have some idea of what you're trying to remove, you'll be lucky to pick the right method of getting it out of your water. A filter that will remove giardia cysts may not be good enough if you're dealing with chemical contaminates. Even without access to a microbiology/chemistry lab, you can do some research before a crisis to get an idea of what to expect. This is where things get personal, because there are too many possibilities for me to list them all. You'll need to think about where you may be when you need a water treatment system and do the research now. How much water per day are you treating? The standard is one gallon per person per day for drinking and cooking purposes, but what about cleaning your body and clothes? Does your water system need to be cleaned periodically? For how many people are you prepping? Larger demands are going to require larger systems to clean your water or multiple smaller ones. How long are you going to be treating your water? It's just common sense that a pocket filter might get you through a weekend in Mexico, but it isn't likely to last for several years' worth of daily use. Be wary of the claims made by manufacturers, unless you've thoroughly checked their system out. The filter that you pick for your BOB may be different than what you'll want to use once you get to your safe location, or you may only need to treat your water until the city gets their plants back online and the pipes flushed. Different needs for different plans. Are you prepared for when your water purification system fails? Nothing lasts forever, so having a back-up plan is essential. It may be as simple as just drinking untreated water for a short period and dealing with the consequences (that weekend in Mexico), or it may be as complex as making another treatment system, but you need to be thinking of redundancy. A good idea for a fixed location would be to store your treated water and rotate through your stocks. That way, when the filter fails, you'll have a buffer supply to give you time to repair it or get another system online. Are you aware of the indications for when your purification system fails? Do you have a way to test your system and the materials and skills to run those tests? One of the first filters I bought for hiking and camping came with a bottle of blue dye. The instructions were to add a few drops of the dye to some water and run it through the filter. If the dye passed through the filter it was a sign that it had failed. I'll get into specifics for each type of system as I cover them, but you need to be aware that there are simple ways to test water systems and you need to be able to run those tests. Are you aware of how important maintenance and hygiene are going to be? Some filters require an occasional backwash to flush them clean while others require boiling or chemical cleaning and others just need to be replaced. Be prepared and learn your system before you need it. Make sure everyone who may need to use it is also trained. Hygiene is an absolute must-have in any crisis situation. Sharing a water bottle with another person is also sharing their diseases. Unless you're comfortable sharing bodily fluids with someone, get them their own bottle. Keeping your water treatment equipment clean will avoid cross contamination. Think about it: if your hands are filthy, do you really want to touch anything that is going into your mouth? It would be wise to pad the numbers in your answer to number 3, above, to allow for some surplus water for hygiene purposes. Those questions should give you something to think about, and maybe form a few questions of your own. I'll discuss the different methods of water treatment and some of the various types of equipment in the next few articles. If you have questions you would like to see answered here, feel free to leave comments and I will do what I can to find an answer. This Christmas, I am working on a very short budget and have friends that don't need anything but deserve much. Four of them have expressed more than polite interest in planning for emergencies of and seem serious about it (by that I mean no 'Zombie Apocalypse' nonsense). I am trying to give them some ideas to use as a starting point; namely, directions to Blue Collar Prepping and some books that I have in my small prepping library. In no way are these books the only ones in my library, the only books on the market or the best for everyone else; they are simply what I recommend for my friends and their needs. I am not writing a book review or summary, but rather why I chose these titles. 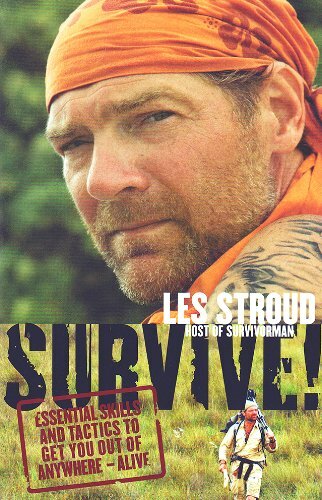 Les Stroud is the host of Survivorman, the best outdoor adventure show on television (in my opinion). His book Survive! 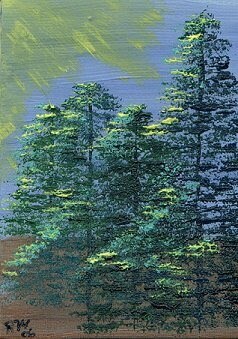 uses the skills and techniques learned from his many personal trips into the wilderness,as well as those seen on his television show. The majority of the book is focused on wilderness survival in any climate, in any part of the world, so this would be a good choice for travelers or people not living in the U.S. or North America. This book is going to friends that hike and camp now that their kids are older. 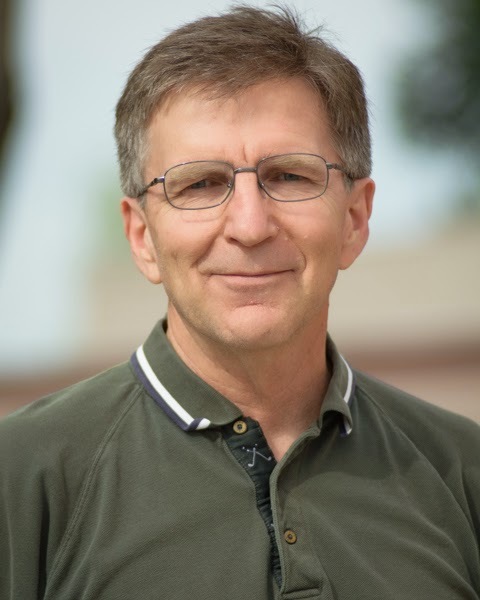 Arthur T. Bradley has written a book that seriously addresses common emergencies faced by modern societies: Natural, Pandemic, Man-Made, War/Terrorism/Crime, Personal, etc. 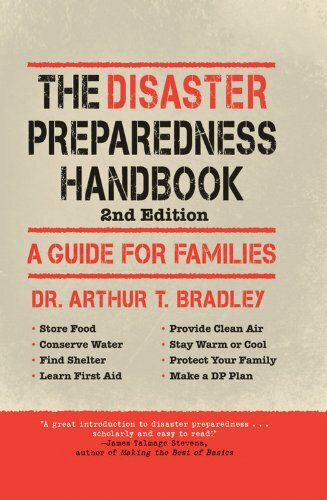 The Disaster Preparedness Handbook addresses these topics in a very thorough way, with chapter summaries, checklists, suggested reading lists and diagrams of items that can be made or built. 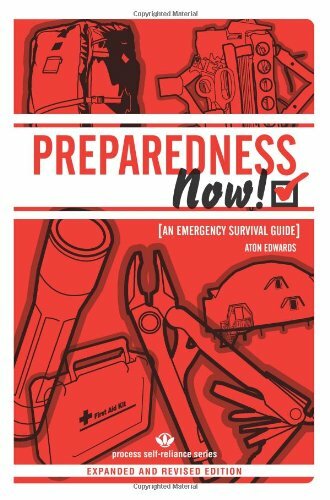 It is written in an easy-to-read style, without being so simple as to be boring to experienced preppers or too intense for those just starting. While most of the book covers 'bugging in' and urban/suburban plans, there are chapters on planning for 'bugging out' as well. This book is going to friends that have several family members living close by. Aton Edwards has collected a massive amount of information on survival techniques and sources of information! From emergency heating to improvised hydroponics, this book could be a one-stop shop for the novice to those already well on the way to self-sufficiency. Preparedness Now! 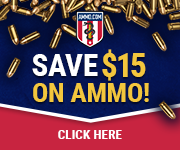 has topics ranging from biological hazards, fire, and personal safety, to the more common subjects of food and water storage or bug-out plans. Included in the back of the book are several pages of notes, blank planner pages, an amazing bibliography and a very detailed set of checklists, sourced and linked back to the chapters where the items were first mentioned. This book is a gift for one of my OCD friends that makes lists for everything. I hope this has given you food for thought and ideas for last minute gifts for the Holiday season! Fire is a valuable thing, but sometimes, traditional fires just are not possible. Today, we'll take a look at a couple non-traditional alternatives. Both of them burn non-standard fuel, and are based on the principle of a candle, basically using a natural-fiber wick to carry fuel to the flame. Both can run almost* any liquid fuel that is thin enough to be carried by the wick. *Warning: Do not use gasoline. It burns too hot and fast and can cause injuries. Calling this a stove is a bit inaccurate; while it can be used to heat things, there are far too many variables to use it to cook reliably . It does, however, make a dandy reusable candle, and provides a fair bit of heat for its size. To make a hobo stove, you need a tuna fish can (or similar; any can that is short and wide should do nicely.) and its lid. You'll also need some kind of wick material made of natural fiber. Jute twine, cotton cord, thin strips of cloth; all work well. Completely remove the lid and rinse the can. Make a hole or holes in the lid, just large enough to fit your wicks. More wicks mean more flame, but also dramatically increase fuel consumption. You can use a power drill and a small bit for this, but a hammer and nail also works wonderfully. Bend the sides of the lid down slightly, just enough to give you room for fuel underneath it. 1/4" is plenty. Pull your wicks through the holes. Leave 3/4" or so on the top side of the lid. Trim the wicks so there are a couple inches below the lid as well. Insert the lid in the can and add fuel. Any number of light, flammable liquids will work. Light oils (olive, peanut, etc.) and high-proof alcohols burn quite nicely. The fuel you use will determine how hot and fast your candle burns. Allow the wicks time to soak up fuel before you light them. We used these when I was in Boy Scouts. All that you need to make them is a roll of toilet paper, two #10 coffee cans, and fuel. Stand the toilet paper roll on end in the bottom of the coffee can. When the toilet paper has had a chance to soak up fuel, simply light the top of the roll. It will burn with a flame as tall and hot as a good campfire, so don't light it anyplace you wouldn't light a normal fire. Putting this fire out is where the second coffee can comes in. Stack the second can on top of the fire, and it will quickly starve for air and put itself out. After the cans have cooled, you can put a lid on top of your fire can, leaving it assembled and ready for use again. Both of these fire sources work great when there is very little wood, or when it's wet or snowy. There's no need to be cold and dark out there! We've discussed the planning stages of building the Oven. 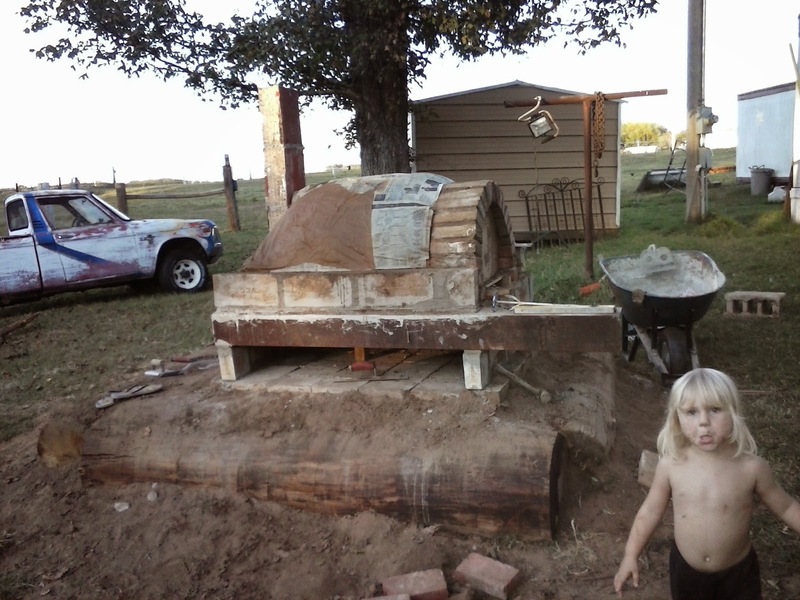 We've discussed building the Firebox of the Oven. 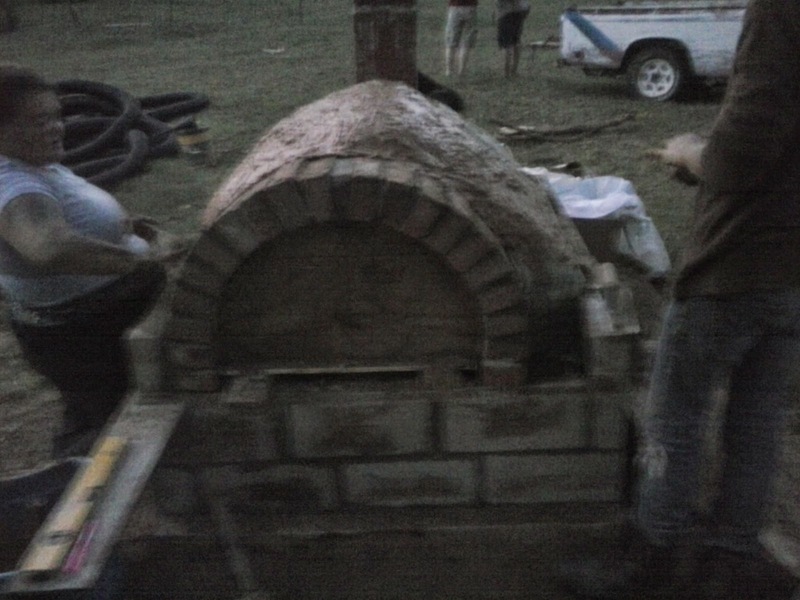 We've discussed building the Cob Dome of the Oven. 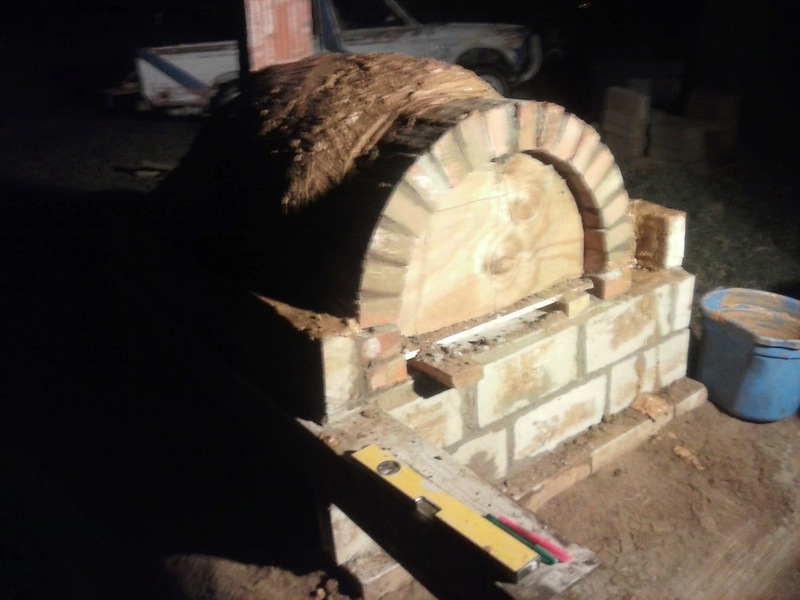 In today's article, I'm going to briefly go over a few things that we learned along the way while building the oven, and where we'll go from here when we have the time and resources to start planning and building the Mark II Oven. Frankly, this is something that all preppers should take note of, regardless of what they're trying to be prepared for. There is a huge gulf of difference between Theoretical Knowledge and Practical Knowledge. Nothing shows this quite as thoroughly as taking a group of people who have practical knowledge in a diverse set of areas, but only theoretical knowledge in the area you need, and asking them to collectively tackle a practical project. I joke that my main "talent" actually lies in the area of being able to surround myself with extremely talented and knowledgeable people. This project proved to me that I wasn't joking. One of the first things that I realized was that we should have spent a bit more time considering our placement. While we built the oven in a location that's very convenient to the industrial kitchen on-site, the location we chose is such that the person (or people) manning the oven are fairly removed from the majority of activity taking place out at Knight's Rest Retreat. This has both advantages and its disadvantages. One advantage is that the cooks manning the oven don't have the opportunity to get distracted by other things going on at Knight's Rest. The disadvantage is that the cooks can easily get bored, and therefore become unwilling to man the oven. Another issue that I realized could be a problem with our oven is its location in relation to the resources needed to build it. 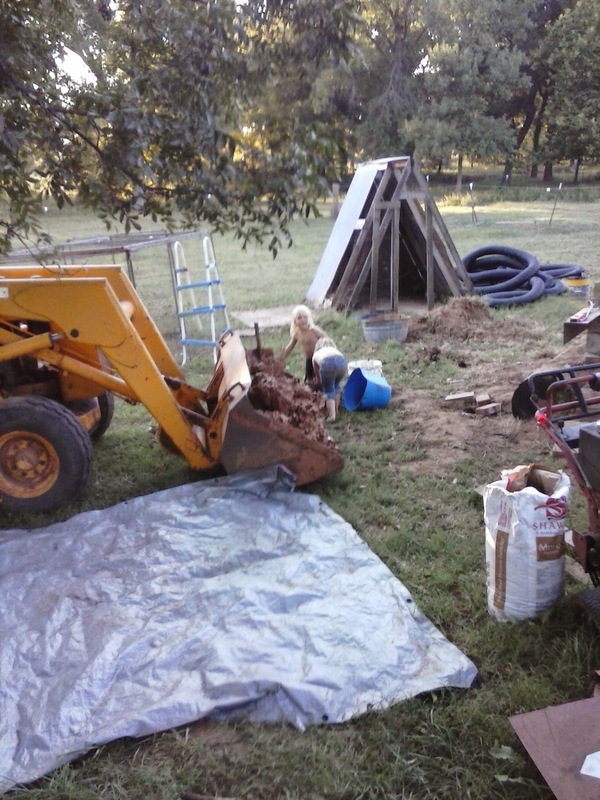 We were fortunate that we had a functional backhoe to use for bringing clay from our clay bank to our location, and our water source was a spigot with a convenient hose to drag closer to where we were building. Remember that your resources will have to be hauled to your chosen location, so pick a spot where you're not going to wear yourself out before you ever actually start building. The less hauling of resources you have to do, the less energy you're expending. Less energy used = less need to rest and refuel later. 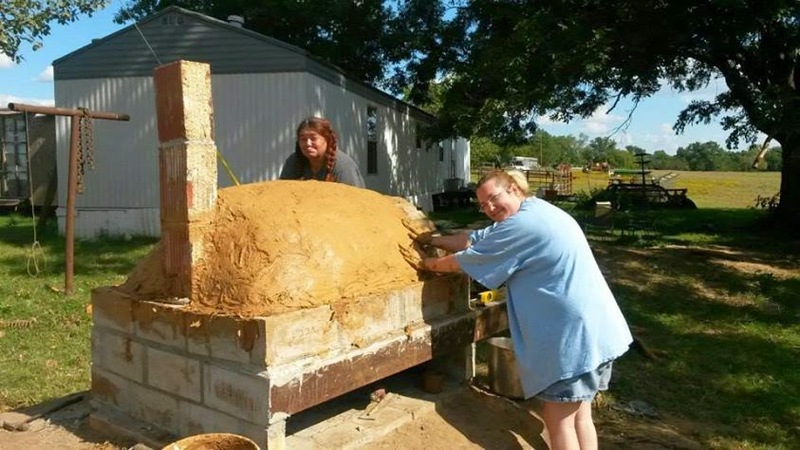 Just how flat is the piece of dirt where you're planning to construct your oven? Have you got a nice, level spot that just happens to have a concrete pad already in place? If you have a concrete pad available to work on, use it! If you don't, then either build directly on the ground, or make sure you build a platform that is going to be both stable and level, without the possibility of it sinking or caving in. We've run into difficulties with the long-term viability of the Mark I simply because the earth platform we built for its placement has shifted quite a bit, and some areas have compacted much more than others. There have been a few minor earthquakes (something we never used to experience in Oklahoma!) that have caused portions of the packed earth platform to no longer be completely level. If you're building directly on the ground, bedrock would be a great choice. At the very least, look for an area that's not going to be making its way out from under what you're building, and make certain it's well packed and solid. Temperature control has been something of an issue. We still haven't gotten it completely right yet, but we're working on that! Have a thermometer handy that can withstand the anticipated temperatures inside your oven, and use it as you do your progressive firings to cure out the cob dome. This will give you a much more accurate idea of what size fire you're going to need to achieve specific temperatures. Having a good in-oven or in-grill thermometer handy during cooking uses will also help you maintain your fire, and know exactly what temperatures your oven space is reaching during the cooking process for specific dishes. Adjusting recipes is much easier when you actually know what internal temperature your oven happens to achieve. 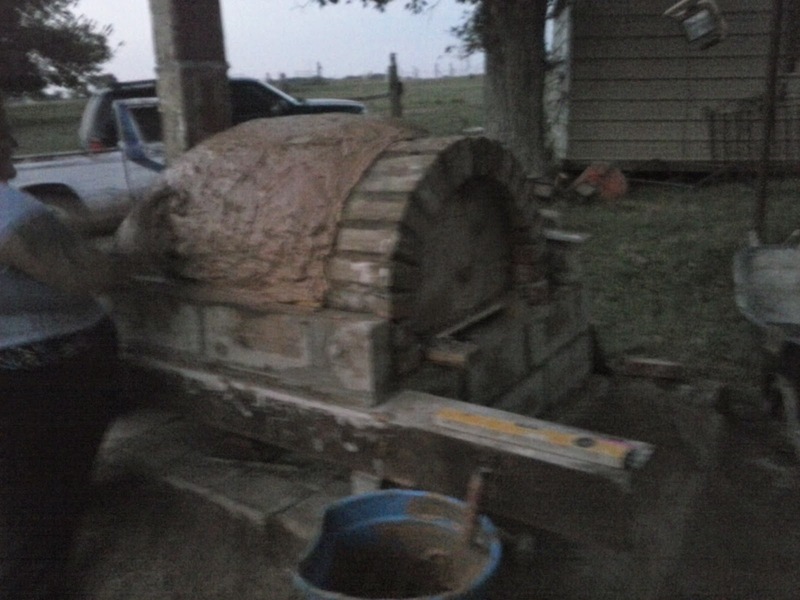 Eventually - probably in late spring - we will get started on the Mark II Oven build. This will address problems that have arisen with the Mark I either during construction, or since it was finished. We've chosen a spot not far from where our current Mark I Oven happens to reside, but situated closer to where our Main Hall is being built. This will put its placement more centrally located, which should help keep the boredom factor down. The change in location will also cut down on the amount of foot work to go between the oven and the Feasting Hall while carrying hot food straight out of the oven, like fresh bread. We will be taking the time to do a few things to the location chosen for the Mark II prior to starting on the actual building. First, we'll be leveling and grading the area. Once it's leveled and graded, we'll be pouring a single concrete slab of the proper size to accommodate our Mark II, and allowing the poured concrete to cure for several days. Another major difference between the Mark I and the Mark II will be use the exclusive use of refractory cement, rated for extremely high temperatures, as mortaring for our firebox. 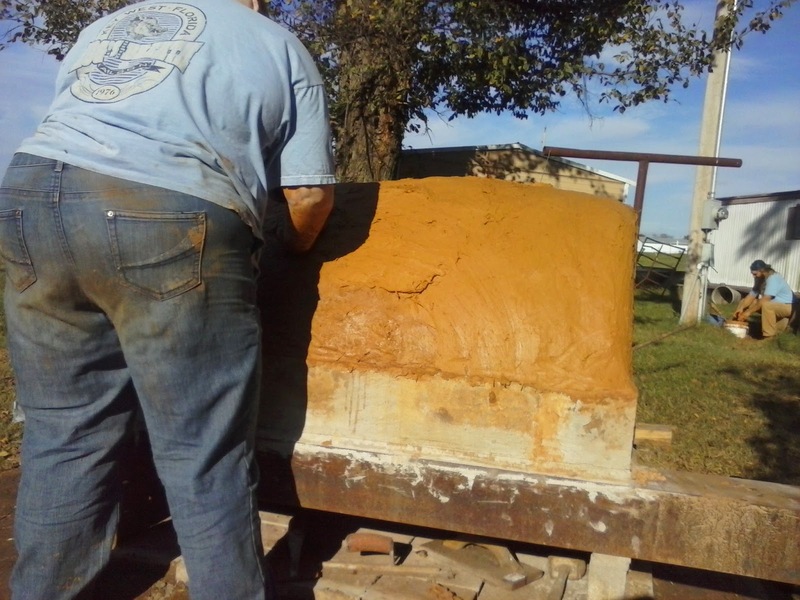 We used regular cement mortar on the firebox in the Mark I, and it was a mistake; we've had a lot of cracking and expansion due to the high temperatures in the firebox, and it has caused issues with the stability of the entire structure. We will also likely have a much longer cure time in firing the cob dome on the Mark II, because we feel like it got slightly rushed for the Mark I. All in all, it's been both educational and fun, and I'm looking forward to working on the Mark II and other ongoing projects out at Knight's Rest Retreat. Erin Palette talks about prepping for pet owners. Nicki Kenyon explores foreign aid to Israel. Special Guest Ben Berry from The Triangle Tactical Podcast tells us why we should all be shooting competition. Barron B. tells us about future developments in more secure credit cards. Weer'd rounds out his "Gun Death" series with the very serious subject of suicide. Don't miss the show. Download, listen, and subscribe. And make sure to tell your friends! In Part 1, I talked about what's in the sleeping bag compartment of my bug-out bag. For today's post I'm going to talk about what I have on the outside. You can see the Klymit Static V air pad, mentioned in last week's post, on the left of the sleeping bag compartment and the Adventure Medical Thermolite Bivvy on the right. Just above the Klymit is a Cold Steel Kukri Machete which I use as a universal chopping & hacking tool (and for $20, one of the best blades I've ever owned -- HIGHLY recommended). In the center is a UVPaqLite UVO Necklace, which I have tied around a fastener on the back so I can easily find my pack in the dark. If necessary, I can remove it to mark something else, like a campsite or a family member. I've also added some compression straps to keep everything tight so that the center of gravity is closer to my spine. a Condor MOLLE pouch, filled with things I might need to access quickly without taking off my pack. Two S-biners (in blue) that secure the "lifting straps", for want of a better term -- basically straps that attach to the top of the frame so that it's easier to stand up with the pack by pulling on them in my hands -- to the plastic D-rings on the shoulder straps. That way, I don't have to go fishing for the straps when I want to stand up, and extra carabiners are always useful. 1) a Hot Shot signal mirror with whistle. 2) a Coughlan's compass with light-up face. It's a fairly cheap compass, but I have a nicer one inside the bag, and this one self-illuminates. 3) two rolls of camper's toilet tissue, for use in the traditional manner, or as kleenex in case I need to blow my nose (and given my allergies, I need to do that a lot.) The third roll, along with the dispenser, is inside my Get Home Bag. 1) a multi-tool from Duluth Trading Company in a cordura pouch the same color and texture as the Condor fabric. 2) a tube of Blistex medicated lip balm/sunscreen. 3) a Sawyer Mini Water Filter (thanks for the Thankmas Present, John Kochan!) with 16-ounce collapsible drinking pouch. Since the filter and the straw are large, I have them outside the pocket and are held in place by the cords that tighten up the gadget pouch. Left: Attached to a carabiner is a "Bug Out Band": a nifty USB drive integrated into a rubberized slap bracelet that came in the October Apocabox. I use it to store important documents (see my "Scan Your Stuff" post ) and being attached to my pack makes it easy for me to take it off when info needs to be updated. The sheath of the Kukri machete is held in place by two Nite Ize Figure 9 carabiners hooked over a strap, with the 'biner part running through the sheath's belt loop. Right: The other side, just for completeness' sake. The odd bits of green are lengths of electrical tape, used to tie down lengths of errant strap. Next week: What's in the pockets? To recap the idea behind the Rock Ridge series, not everyone is going to be able to go back to living off of the land after a major catastrophe. There will be those who are not suited to raising their own food, but will have other skills that they can use to make a living. I am using the fictional town of Rock Ridge (ca. 1870) as an example of the skills and services that may be in demand after TSHTF. It doesn't have to be “Mad Max in Thunderdome”; people lived comfortably in small towns and villages for centuries before the invention of electric lighting and automobiles. First things first: any time you see the word “mill”, you're looking at a facility that takes in a raw material and produces a marketable product, with windmills being the sole exception that proves the rule. Wood (or saw) mills take in logs and put out lumber; cotton mills take raw cotton and turn it into thread; a grain mill will take grain and turn it into flour or meal suitable for use as a cooking ingredient. If you have a reliable source of energy and grain, you might be able to make a living with a grain mill. Grain mills are simply large versions of the basic stone utensils that have been used to make flour out of grain for as long as humans have been growing grain. The most basic grain mill is a bowl-shaped stone (called a “mortar”) and a smaller rounded stone that fits inside the bowl (known as a “pestle”). 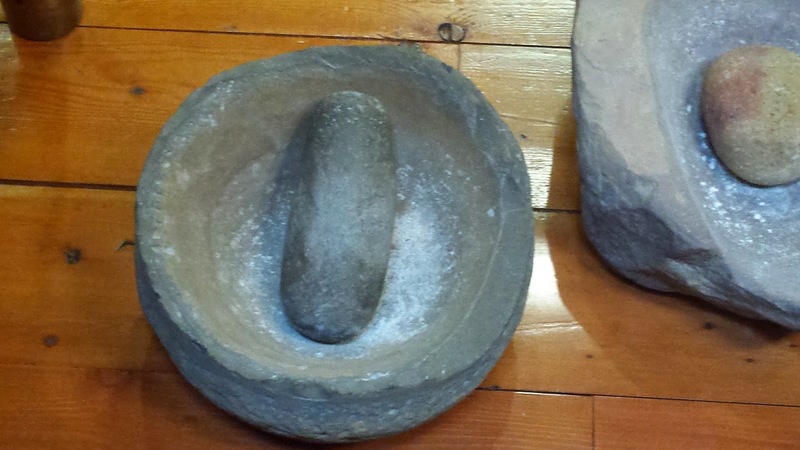 Grain is placed in the mortar and the pestle is either rolled over it with downward pressure or pounded down on the grain to break it up into tiny pieces. Roughly ground grain is called meal, and finely ground grain is called flour. 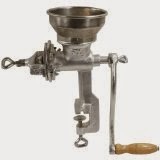 Hand mills have evolved into steel and plastic kitchen appliances that vary in quality and price. The general rule that “you get what you pay for” holds true for hand mills, so get the best that you can afford. Unless you have a bullet-proof source of electricity, avoid motorized mills that don't also have a manual method of operation. 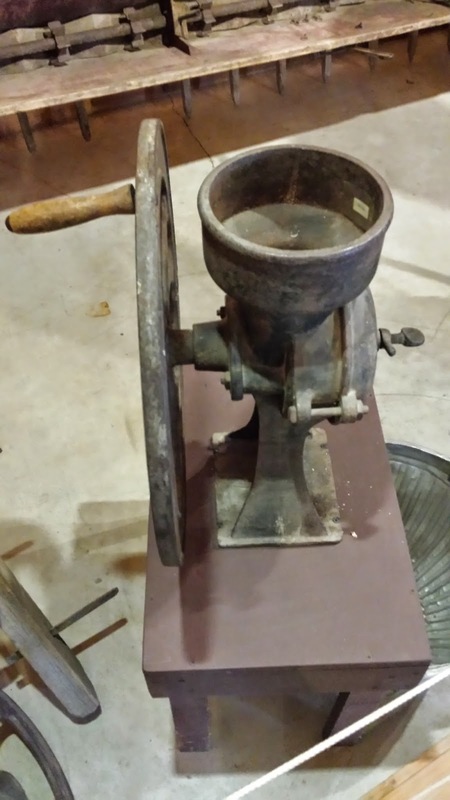 Grinders like this have been used for decades to mix and grind meats, but if you get the right plates for it you can grind grain. Avoid the cheap ones since they are generally of very poor fit and finish. While a single person can grind enough grain into flour to keep their family in bread, it is time consuming and not a very efficient use of time. A centralized grain mill will tap into a local source of power and provide the service of producing flour (or meal) for its customers in return for a percentage of the grain. The miller's percentage would be sold or traded to people who didn't grow grain, and provided a source of income for the miller. 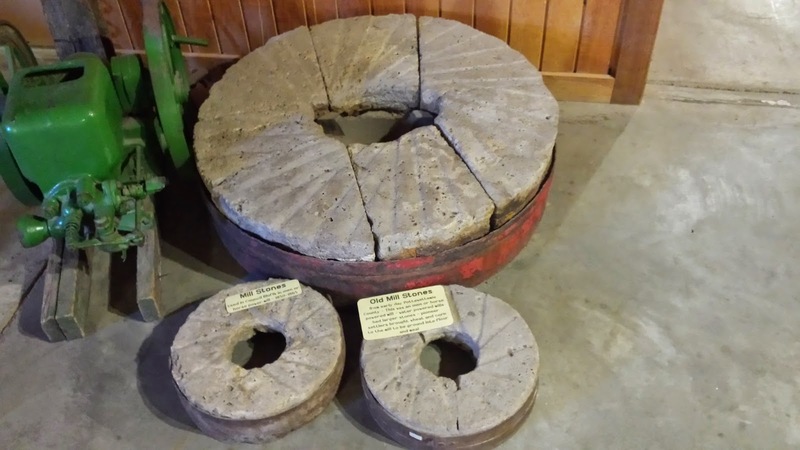 A small commercial mill, like those found in villages, was usually made of two discs of stone (often pieces of stone held inside a metal ring). They were placed face to face and the grain was introduced through the center hole of the top stone. The grain was turned into flour as it worked its way out toward the the rim. A moderately-sized mill, suitable for a small town, would consist of two round stones, one placed flat and the other on edge riding on the top of it. Grain would be added to the top of the base stone as the wheel stone rolls around on top of it and the grain ground between the two. Power sources for this size of mill would be a water wheel set on a stream or a wind mill with large sails. High torque, low speed power that can be harnessed with the use of mainly wooden gears and shafts is a good fit for this kind of mill. 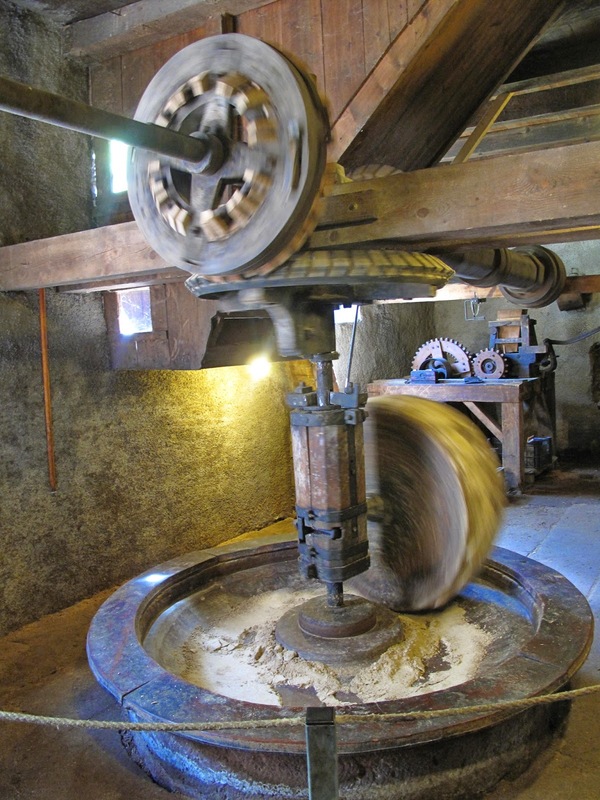 A large mill, producing flour for a large bakery or a large town, would likely consist of a series of smaller mills in series, with them set to grind the grain into progressively smaller pieces. Larger mills are/were powered by steam engines, electric motors, or some form of internal combustion engine. Stone grinding wears down the grinders slowly, leaving sand or grit in the flour. This is not normally hazardous to the health of the consumers, but it can lead to increased wear on their teeth. Steel rollers last a lot longer and are easier to replace with modern infrastructure. Since steel wears slower than stone, it is easier to set and maintain the desired degree of grind you want. Steel is less porous than stone, so it is easier to keep clean and prevent contamination of new flour from spoiled remnants of previous grindings. Steel rollers can be run at higher speeds than stone mills, increasing the output for a given size of mill. Steel rollers generally weigh less than stone ones, so starting and stopping the machinery is easier. They can be made of locally available materials. Stone rollers are not as likely to create sparks as metal ones. Dust explosions are a major hazard of any grain handling operation, so sparks are to be avoided as much as possible . The weight of stone rollers provides enough pressure without requiring tensioners. Running at a slower speed allows for the use of simpler bearings and shafts, often made of wood instead of metal. Lower speeds also mean less heat, which can damage the grain or contribute to dust explosions. The mass of stone rollers provides inertia to the operation which will smooth out minor variations in the power source. This is helpful when using wind or some other form of variable power. Setting up a grain mill is a time-consuming process that will require a source of power, a good supply of materials, a source of grain, storage for grain and flour, and a customer base. Operating it will require a low level of daily supervision, a moderate amount of maintenance, and plenty of customer interaction. A good miller will work with his customers as much as his machinery, and his reputation can make or break his business. Bookkeeping and an accurate set of scales will help keep both the customers and the miller honest, so plan for them as well. The holiday season can be a fun time of year to gather with friends and family to share happy times and events, but it can also be a time of stress. Not having enough food on your table, let alone enough money to pay the bills, is an extra stressor that many people have this time of year. While I do not have that problem, many in our communities do, and there is a way that anyone can help: Donate to your local Food Bank! So by sorting my stored goods with the oldest marked items going out first, I can keep an eye on what is not being used quickly, and then donate the excess to the Food Bank if needed. Not only can I help those less fortunate than myself, I also keep fresh items in my reserve! These were all dated 'Best By' the middle or late 2015, but it is the perfect time to move some of these out, as I am not using them very quickly all by myself. Even if you don't have food that is expiring soon or you have long duration stores, this is a good time to consider buying an extra can or two and dropping them into the donation barrels most supermarkets have on display. You will be helping others and also helping yourself. 28% of food distributed is for children under 18. 8% are under the age of 5. Approximately 18% is for people over 65. The average family income of recipients is $15,000 per year. Matches are the gold standard of fire starting: they're cheap, readily available, and reliable, and things that are designed to be lit are usually designed to be lit with matches. Waterproof cases are the most basic starting point of protecting your matches. A waterproof case will keep your matches together and protected from water and damage, and most of them have a rough surface for striking your match. If you're equipped to safely melt paraffin wax, it makes a dandy waterproof coating on any number of things, including matches. 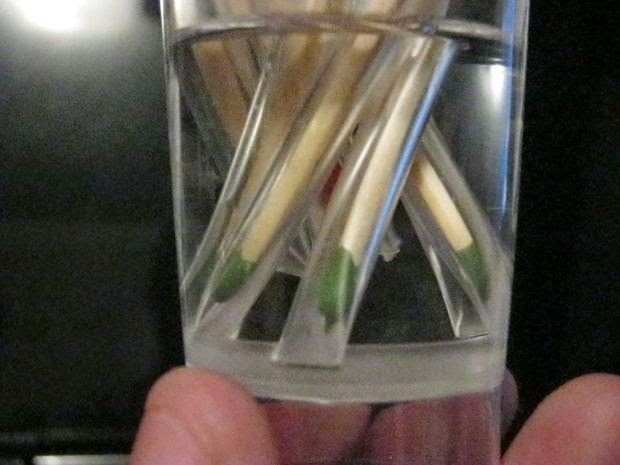 Simply melt the wax and dip your match heads into it, then let the wax cool and harden. When you're ready to use them, simply scrape the wax off with your fingernail, and strike as normal. Melting wax has its hazards, though; and is not something to be undertaken lightly: hot wax can burn skin, and can also cause a very serious fire. Don't try it if you're unprepared and don't have the proper gear. Turpentine is a wonderful, very safe method of waterproofing matches, but it must be renewed about once a year. Simply pour an inch or so of turpentine into the bottom of a small glass (one you don't care for, since you won't want to drink from it after), and stand several matches head-down in the turpentine for five minutes. Then, lay them out on a paper towel or piece of newspaper to dry for about half an hour. 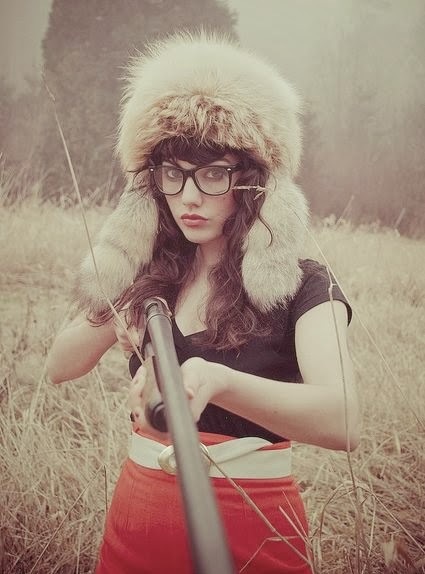 Your matches are then ready to go; just strike them as you otherwise would. Probably my favorite method of waterproofing matches (and sealing various other things) is clear nail polish. It doesn't necessarily have to be clear, but Grandma used clear nail polish for all manner of things, and who am I to argue with Grandma? Simply open your bottle of nail polish, and dip your match heads into the nail polish. Wipe any excess against the bottle rim, and let your matches dry, with the head not touching anything. As with turpentine, they'll strike as-is. However, nail polish dries hard and durable, and will provide a little extra protection for your matches. Sealed Pouches: This page has a wonderful guide to sealing your matches in simple waterproof packets. Other things like tinder can also be sealed in this manner, and be safe and ready when you need to crack them open and use them. 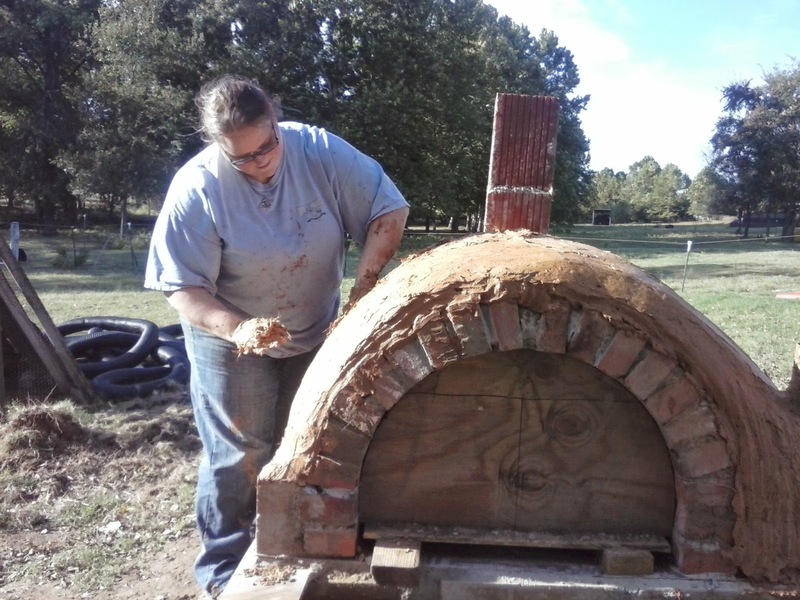 Last week, I talked about the work I and others did to make the Firebox portion of our Earth Oven out at Knight's Rest Retreat. 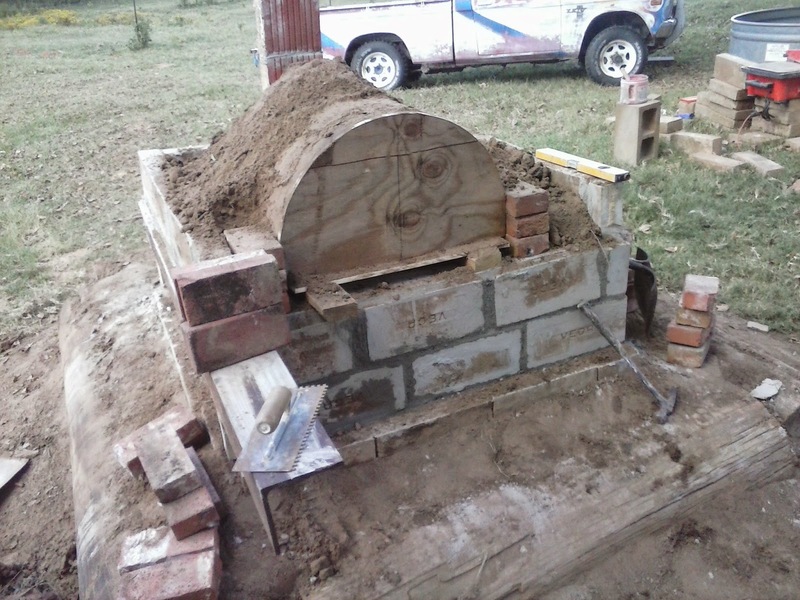 Today, I'm going to further expound on that in the visual, and show you what it was like building the baking dome portion, which is the actual cooking area of the oven. 2 Muffins go in, but only 1 Scone emerges victorious! Anyway, now that I've gotten the cheese outta my system (well, mostly anyway - there are a couple of quiches still awaiting trial runs in the oven to do some more timing/temp tests! ), on to the meat (roasted) of this article. 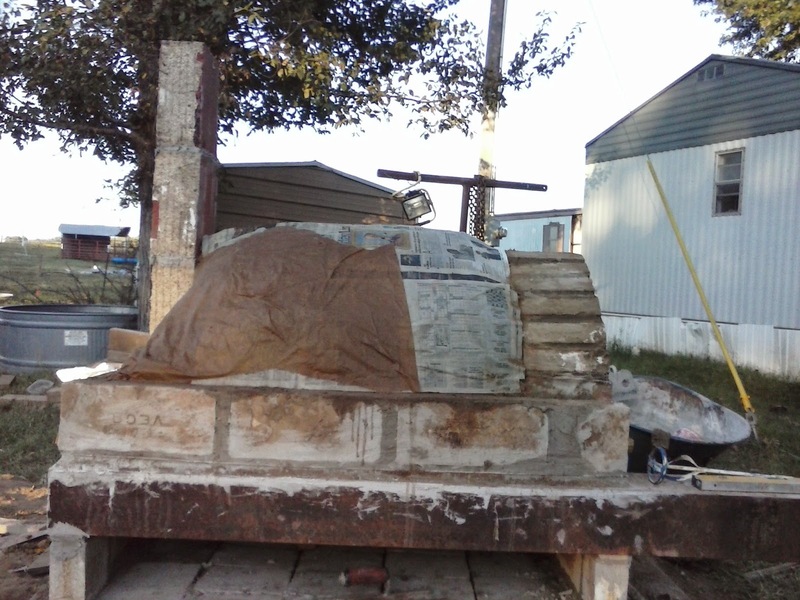 In order to get our dome built on top of the firebox, the first thing we had to do was figure out how to get the actual dome shape built. 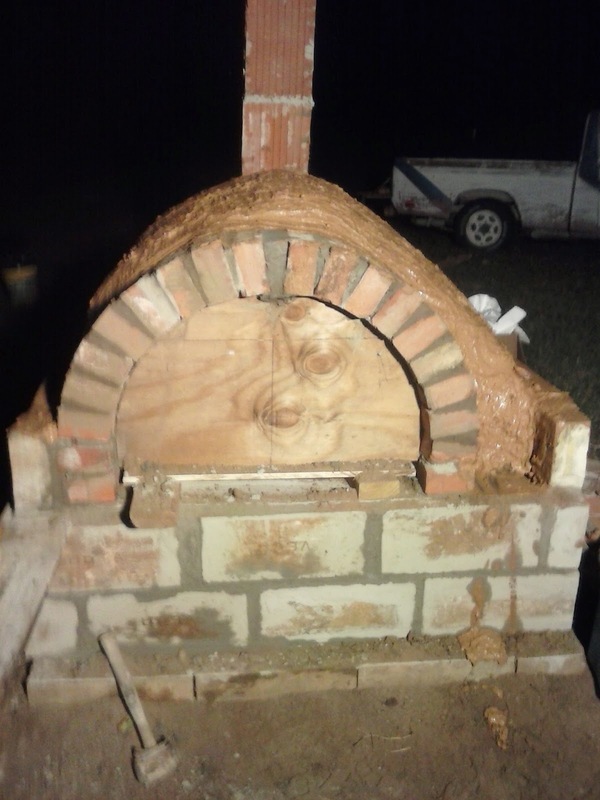 We set the brick work for our chimney while we were making the final decision, and let our bricklayer do his magic while the rest of us debated about method. 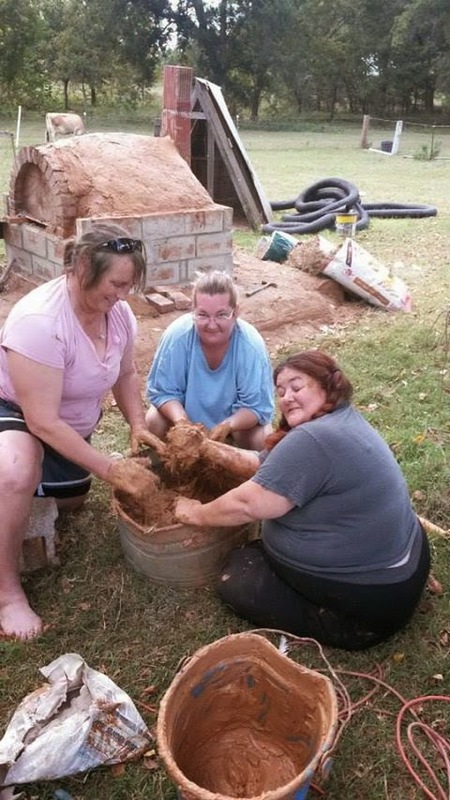 We decided it would be easiest to build up layers of our cob over a positive mold of shaped dirt, which could then be dug out once the cob was dry and solidly stable. Once we'd decided how we wanted to proceed, we built a simple wooden form in the shape and size of our intended door and set it in place. 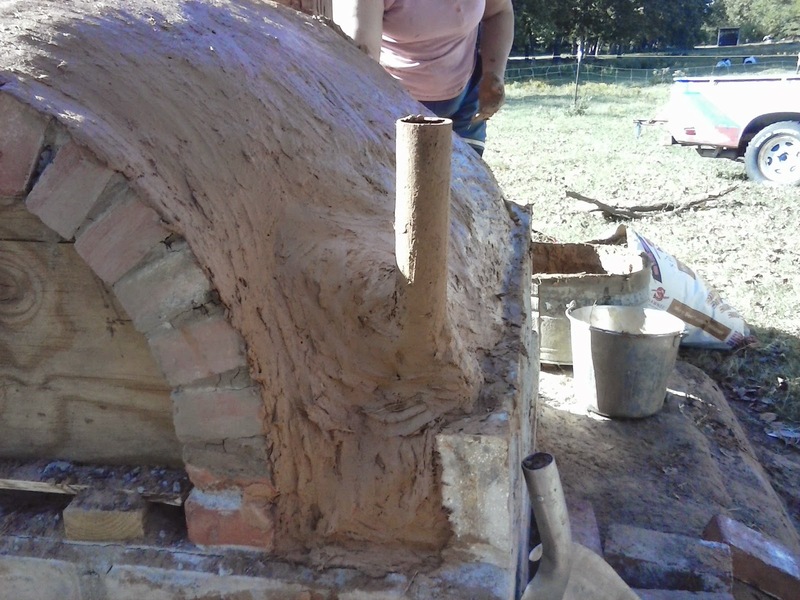 Then we started building our dome mold at that point, packing the dirt in well and making certain it was absolutely level where we were going to be putting the brick arch support of our entry door. 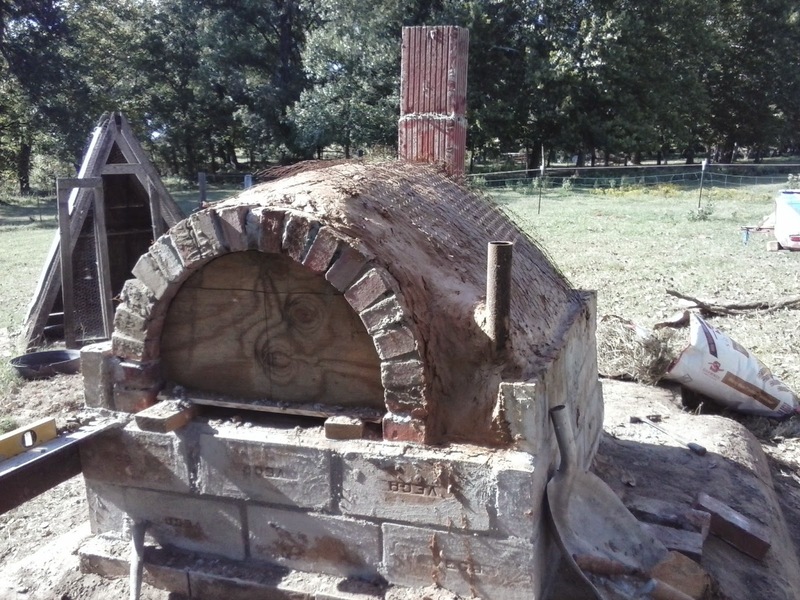 Once we had our door frame mold in place to use as a guide, our bricklayer went to work again, setting our brick archway in place. 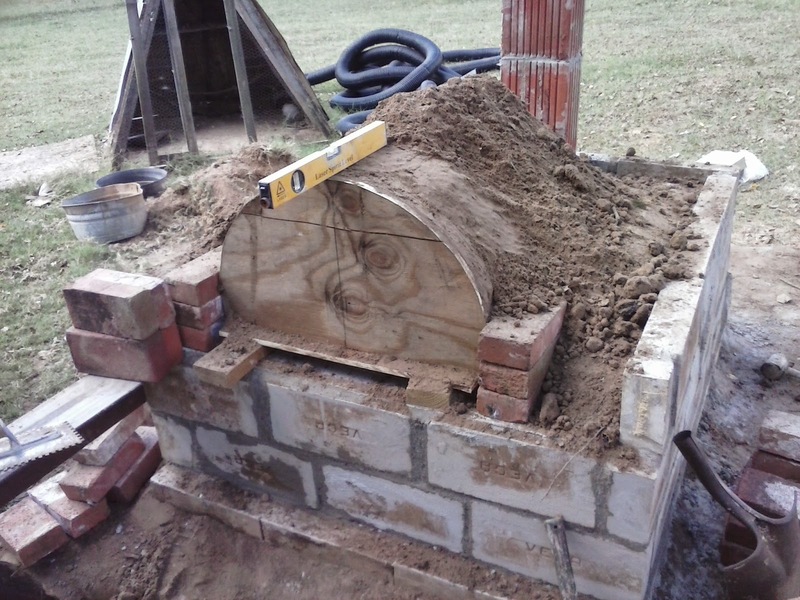 This was a much shorter process than laying the bricks for the firebox, but was still labor intensive enough that I was glad I wasn't the one having to do the actual work. 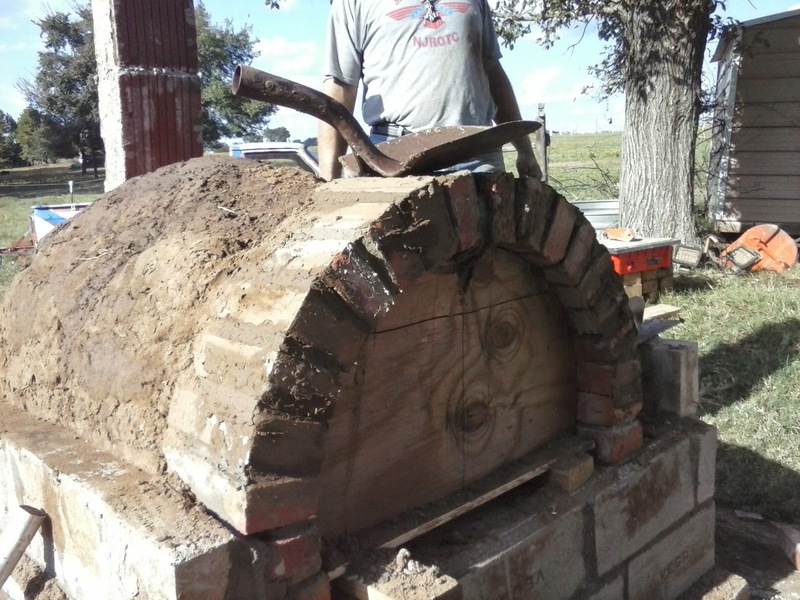 After he'd placed all the bricks into the archway except our keystone (the one at the very top of the arch), things started getting mortared into place. The keystone went in last, and then the mortar was allowed to set while we all took a short break. After the break, we moved on to rearranging the excess dirt so that our dome mold would be uniform in height and properly align with the door. 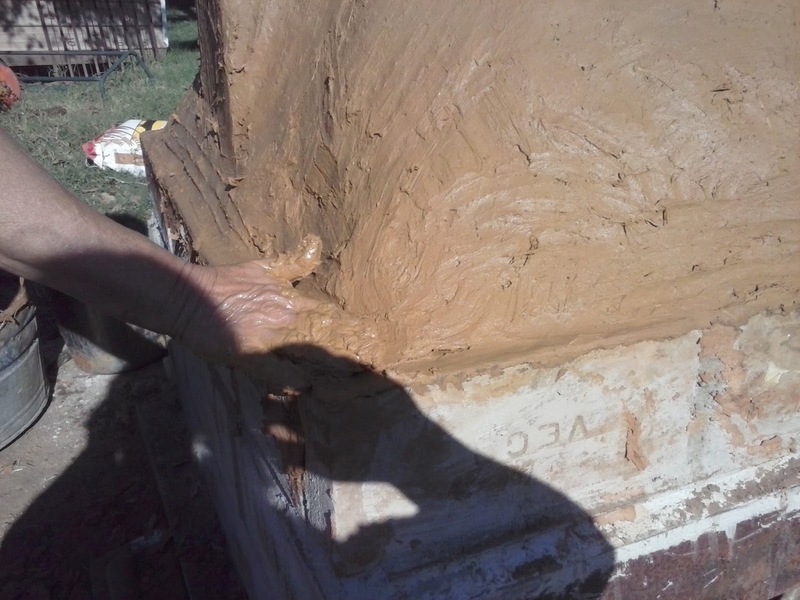 It was a few hours of work, which included turning the top layers into a thick muddy slurry so that it could be properly smoothed out. 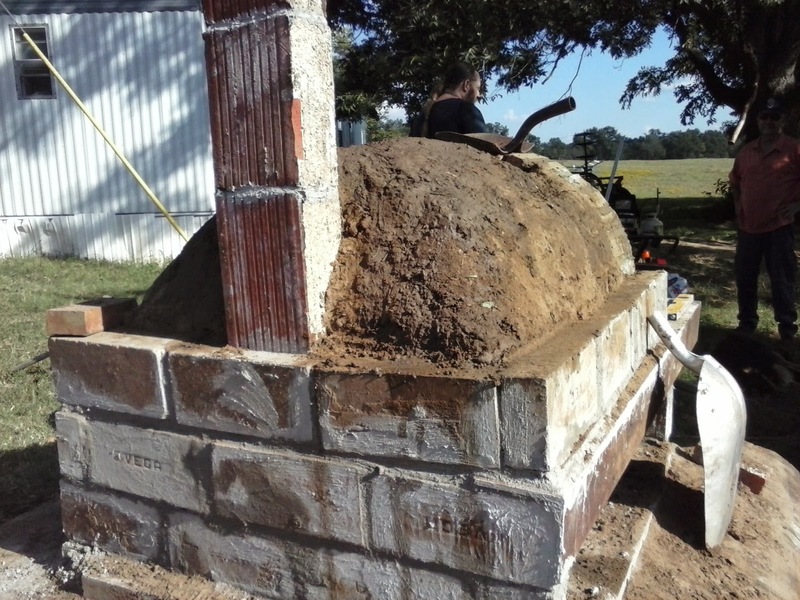 When we finally got everything smoothed and evened out, it was obvious this oven was going to be even larger than we'd originally anticipated. The height of the dome had been lowered, but the overall surface area to cook in was going to be much larger than was first planned. 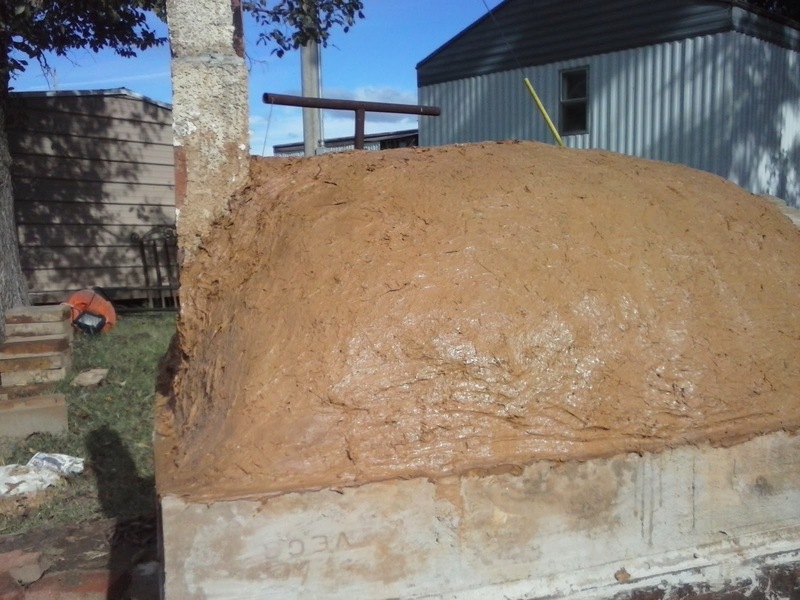 We needed a means of keeping the cob mix from sticking to the positive mold while the dome was being formed. Our solution was simple: newspapers that were going to be recycled anyway were pulled out and put to use. A double layer of newspaper was placed over the entire dome (except for the doorway arch), and then a thin layer of straight mud was put in place as the bottom layer of what would become the interior of the dome. The kids, of course, were more than eager to "help play in the mud"
A helper (right) and I (left) applying the initial mud coat. Once that was finished, it was time to start mixing our cob to form the dome. Cob has traditionally been a mix of clay, sand, and straw. Think of it as a sort of rudimentary cross between the basic material for bricks, and a primitive cement, all rolled into one. Yep, you guessed it. 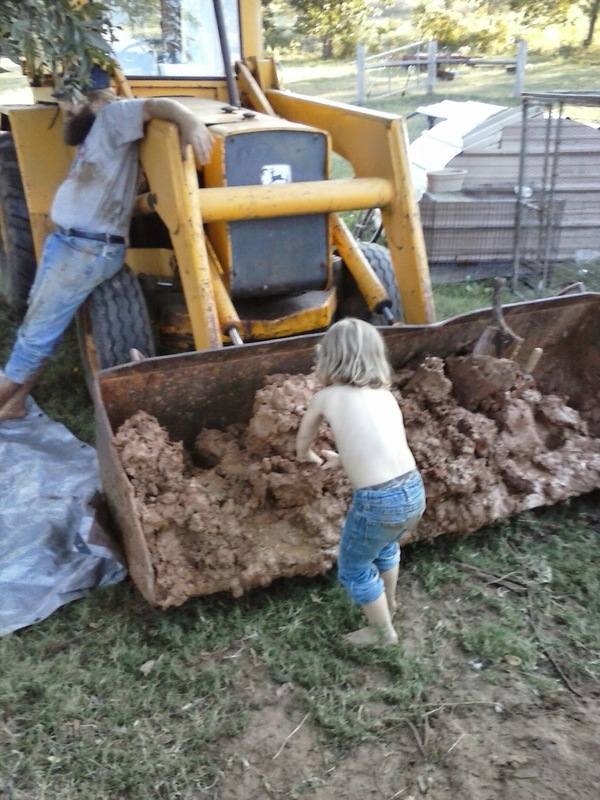 Trevor's kids wanted a chance to play in the mud for that part too! Thankfully it was still pretty warm outside in late September and early October here in Oklahoma, so hosing them off at the end of each day wasn't an issue! at least we weren't bad enough to need actual hosing down before going in the house to clean up! 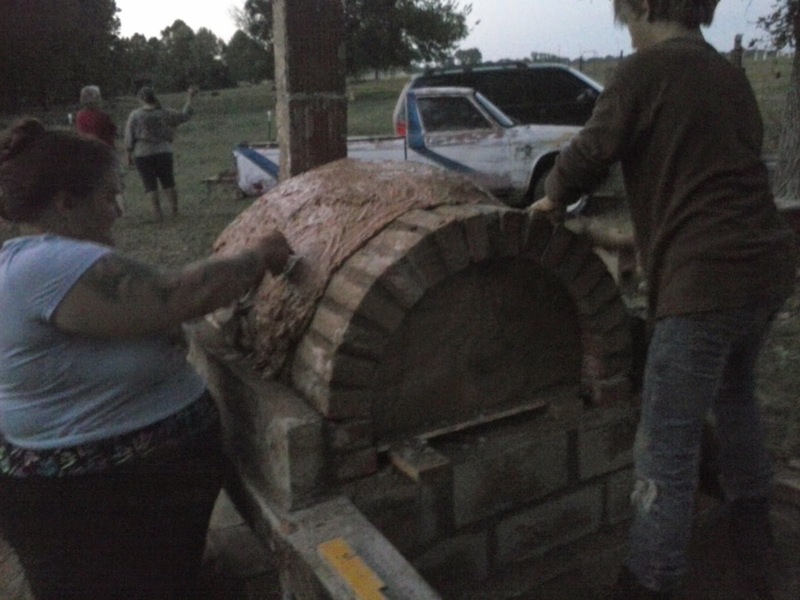 Yes, building the dome of the mold took longer than expected, and it was well past twilight by the time we'd finished putting the layer of straight mud over our newspaper barrier and adding the first layer of cob. Then we needed to allow some time for that layer of cob to set before we added another, but that would require working in the dark. We called a break for the evening to allow things to start drying, and met again a couple of days later to start slathering on further layers of cob. 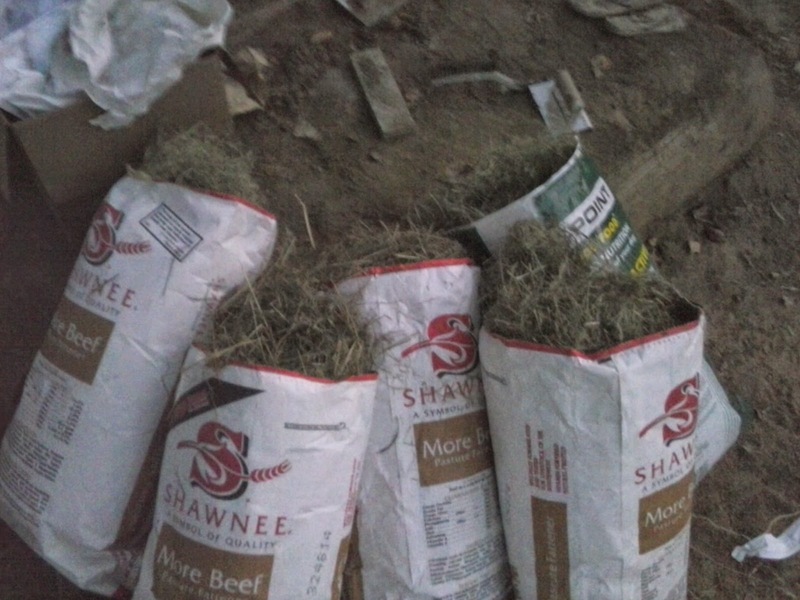 As I mentioned a moment ago, traditionally cob is formulated from a mix of clay, sand, and straw. We used a ratio of 70% clay from the high quality clay banks on the property (there are advantages to having a stream running through the middle of your acreage! ), 20% sand from the one of the sand banks of the same stream, and 10% high quality grout mix that we happened to have on hand. 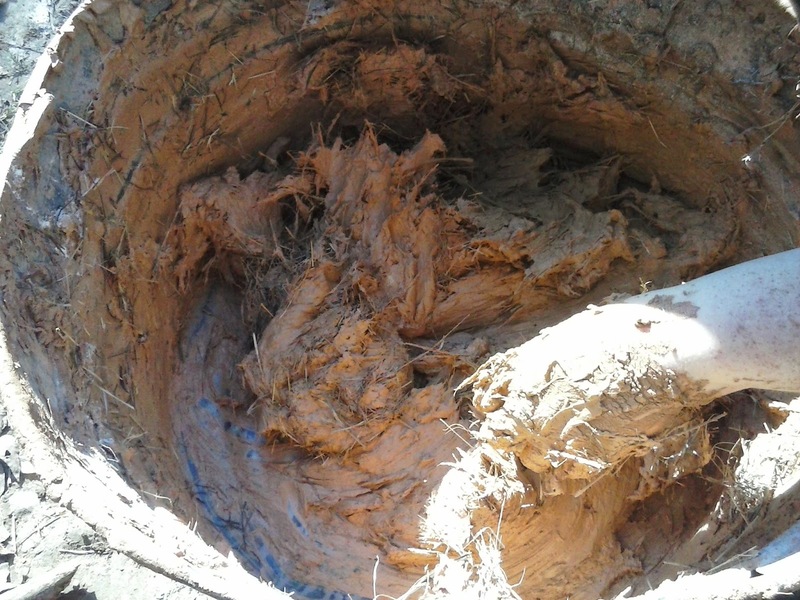 We mixed up our mud - that clay/sand/grout mix - in a small bucket until it was the consistency we desired. We originally intended to mix our mud completely by hand, but that proved to be far too labor intensive when we considered Cordless Power Drills and Drywall Mixers! Once our mud was mixed by one of the guys, he would bring it over to our big mixing bucket - a repurposed and somewhat banged up small feeding trough. 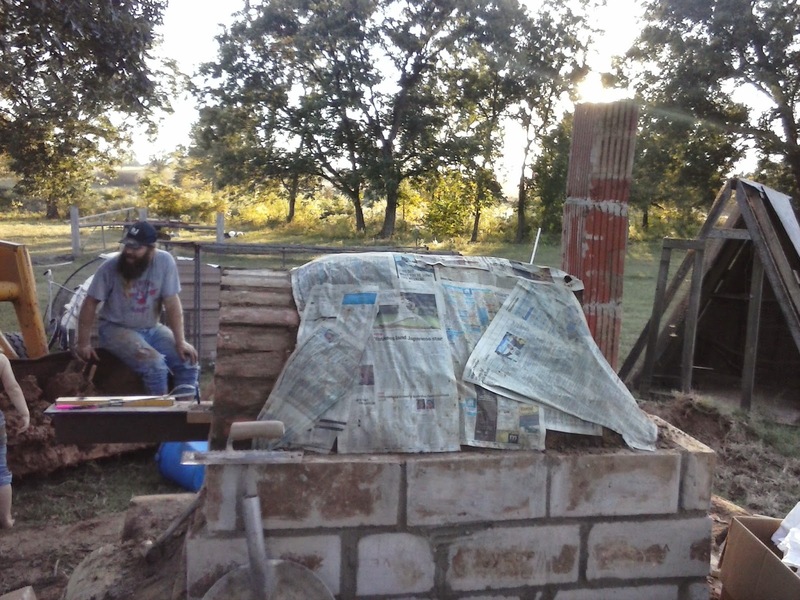 The mud would be dumped from its small mix bucket into our larger mix bucket, and we would then add a 50% straw content to add support and help hold the structure of the cob over the long term. This portion was done completely by hand, as we didn't want the straw tangling itself around the mixer bit - and we only had one mixer bit available for use. This also proved advantages in other ways. Since our Mud Guy could only mix up so much on his end at any one time, we had the lag between mud deliveries to mix in straw, and place the now ready cob onto whichever portion of the dome we were currently concentrating on for that layer. After getting the initial 2 layers of cob in place, the thought crossed several minds simultaneously that adding some extra internal support structure might be a Good Thing over the long term. To this end, we decided to place a single layer of chicken wire between the cob already in place and what would be going in on top of this. 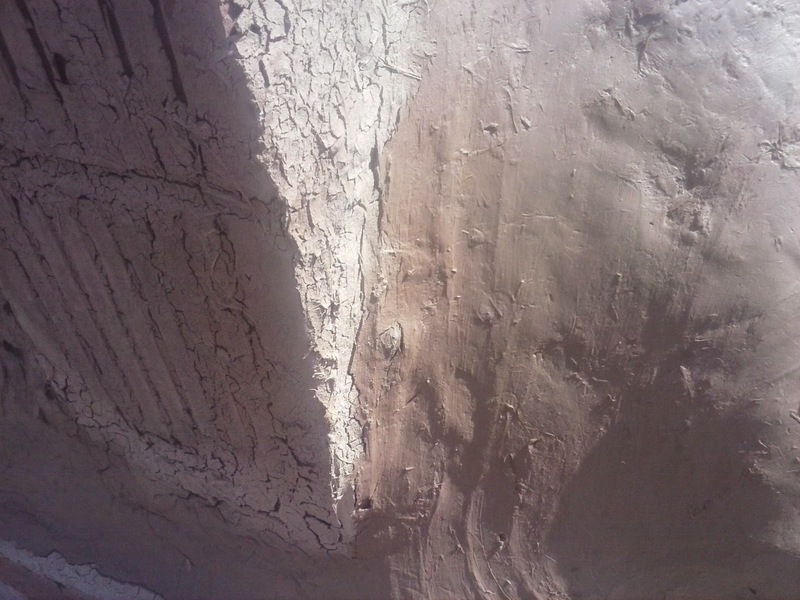 At this point, we had our positive mold in place, our door arch built, a thin layer of mud without cob mix, 1 thin layer and 2 thick layers of cob, then a layer of chicken wire, and 2 more thick layers of cob over the wire support structure. 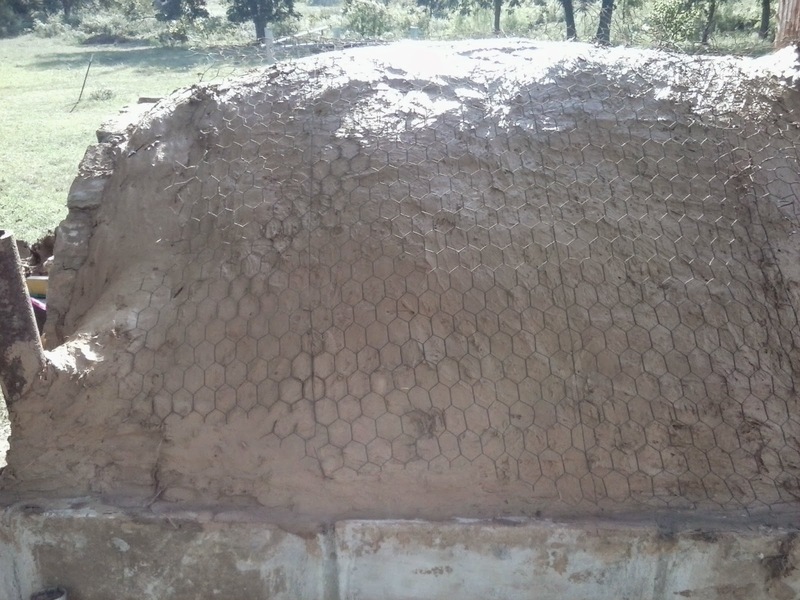 And it was back to work placing thick layers of cob mixture over the entire dome. At this point it was decided to pay a bit of extra attention to the area where the dome was being built up around the base of the chimney. 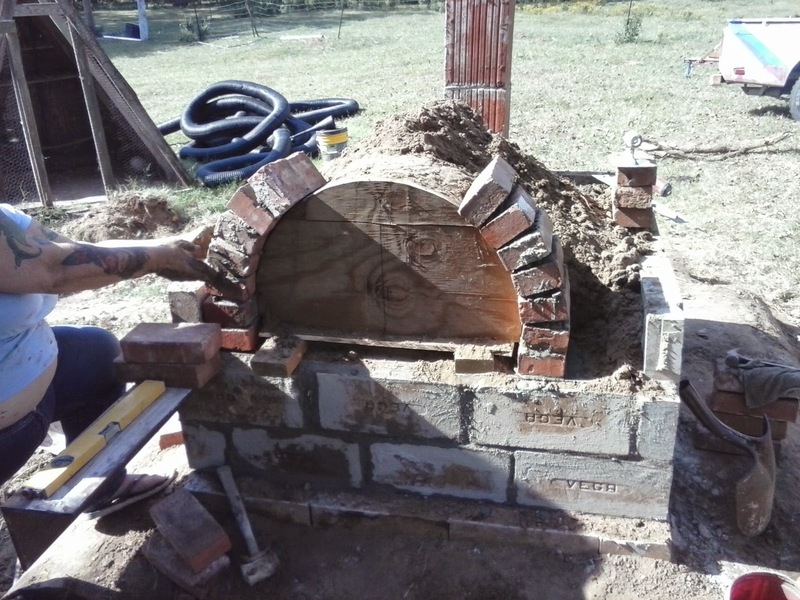 We wanted to make certain we had a good seal between the cob and the brick, so that we wouldn't have to cope with excessive heat loss or unexpected drafts of air through the cooking chamber. As a group, we spent 6 days of laying in a couple of layers of cob each day, and allowing for a day or two of drying time between sessions. We wanted to give each successive set of layers time to dry somewhat, independently of the whole, so that we could locate and repair cracks without them becoming deep fissures that ran through the whole thickness of our dome structure. Our final day on the project to build the dome itself, there were only 3 of us out there getting muddy - Jen (the owner of Knight's Rest) myself, and my buddy Vanessa. It's mid-October, and you can see from the photos that it was still warm enough for shorts and t-shirts! 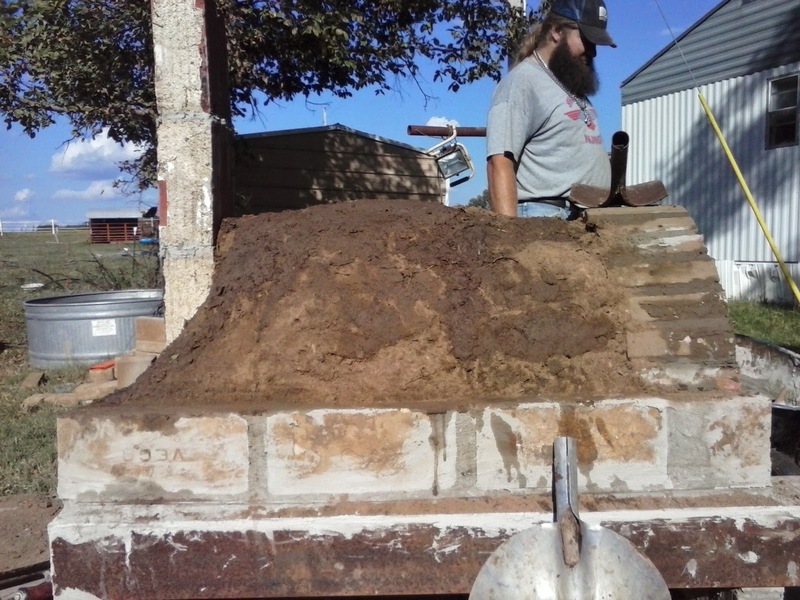 Laying the final layer of cob turned out to be the most time consuming of all the cob layers. We wanted to make certain it was smooth, uniform, and was visually appealing. A lot of smoothing, both by hand and with small bricklayer's hand tools later, and we finally had things looking the way we wanted them to! Our oven build was complete... almost. We still needed to give it a week to dry out completely. Then we had to dig out the dirt used to form the positive mold for the dome. And build several fires, each one successively hotter and more intense than the last, in the cooking chamber itself to cure out the cob completely and to burn off the remains of the newspaper we used to keep the mold and dome separate. We're still doing test runs in the Oven, to see how large a fire we need for various temperatures, and how we need to adjust recipes for timing so we don't end up with burnt or undercooked foods. While under-cooking can be salvaged easily enough by simply putting our cooking vessel back into the Dome for a bit longer, burnt bottoms aren't so easily fixed. Next week, I'll discuss some of the difficulties, tips, and tricks that we learned during this build, our plans for the Oven Mark II, and extra considerations to be taken into account for different areas. Bon appetit!